Annual grants to community groups from the Mayor’s Fund last year declined 33 percent because of debt from an ill-advised $3 million deal made by the former city representative who was chair of the fund’s board, fund officials said this week. In December, the fund awarded program grants totaling $200,000 to 18 organizations and two city departments, down from the usual $300,000 available. Former City Representative Desiree Peterkin Bell, who ordered the $3 million deal in 2014, is charged by state prosecutors with theft and misuse of public money stemming from her oversight of the Mayor’s Fund, a nonprofit used to promote Philadelphia and advance the mayor’s policy goals. The awards, announced Tuesday, included $20,000 to Ceiba for a municipal ID program for people who lack identification cards; $15,000 to the African Cultural Alliance of North America for a work readiness program; and $15,000 to the city Office of Homeless Services for a meal program. The fund manages about $12 million in private grants and revenue from the Philadelphia Marathon and the Indego bike share program, with most of that money allocated to city and nonprofit community programs. But the fund’s board has discretion to spend any surplus left after the $3.5 million marathon — usually $500,000. About $300,000 of the surplus is set aside each year to help community-based organizations and some city departments pay for programs tied to mayoral goals in education; sustainability; government efficiency; public safety; and promoting the city. That pot of reserve money became the source of various investigations into the Mayor’s Fund and Bell. A state grand jury charged Bell in October with six felony counts related to public corruption for alleged theft and misuse of Mayor’s Fund dollars. Bell has denied all charges. The grand jury found that Bell ordered the fund’s executive director to sign a contract paying Forbes magazine $3 million to host its “30 under 30” in Philadelphia for two years. “The contract was signed, although the fund’s board of directors was not aware of the contract, did not authorize it, and the contract created a debt the fund could not handle,” the grand jury report said. According to the indictment, Bell directed that the fund take on a $1 million loan from Philadelphia Industrial Development Corp. (PIDC), a quasi-government economic development agency, to help pay for Forbes events. The grand jury also found that Bell had created fictitious sponsorship contracts to try to cover $1 million of the remaining cost. (The third $1 million was written off.) The alleged fake sponsorships led to charges of misapplication of entrusted property and tampering with public records. The fund, however, was stuck with the $1 million loan payback to PIDC. At September’s board meeting, the board voted to pull $375,000 from the marathon account and $125,000 from the fund’s administrative account — about a fifth of its operational budget — to pay the final $500,000 installment to the economic development agency. That’s when the decision to cut back on the community grants was made. 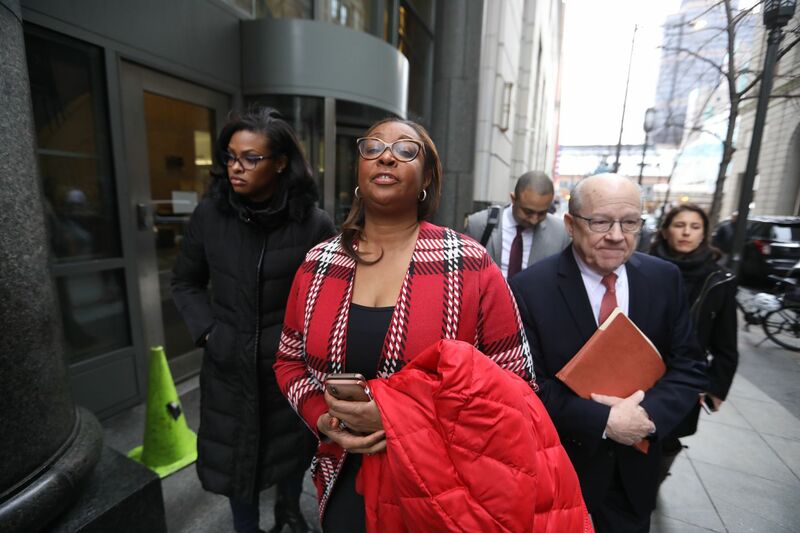 File photo: Former City Representative Desiree Peterkin Bell appears with former Mayor Michael Nutter and Kirk Christensen, Global Leader of GORE-TEX Running Footwear. Rich Levins, vice president and deputy general counsel for Independence Blue Cross, who was appointed chairman of the Mayor’s Fund last March, said Tuesday that if the board did not have to pay back the $1 million, more money could have been allocated to community grants. He said he probably wouldn’t have authorized the Mayor’s Fund to pay for a $3 million program from its own coffers, however. “When we are giving out $200,000 now and $300,000 last year, I think $3 million is not something we have to give in a discretionary way,” Levins said. In addition to the debt, the fund has paid $136,600 so far for four law firms to represent fund employees or board members who are not city employees to testify to the grand jury during the state attorney general’s investigation. The legal fees came out of the fund’s $600,000 operating budget. Neither the city nor the fund would say which employees or board members had legal representation or testified in front of the grand jury.